Save over 80% on your average cost for maintenance and repairs. With modern technology that’s simple to use, maintenance is minimal and updates are automatic. Installation is can be done within hours. Our team of distributors and installers are expertly trained to get you up and running quicker and smoother than ever before. Celebrate a huge return on investment with built-in inventory management, mix and match discounts, unsold item reports, and reduced employee theft – just to name a few. 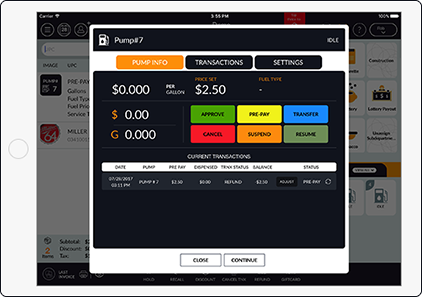 Our POS system is built to protect you and your customers. With our EMV-enabled software, you will reduce fraud and free yourself from any liability. 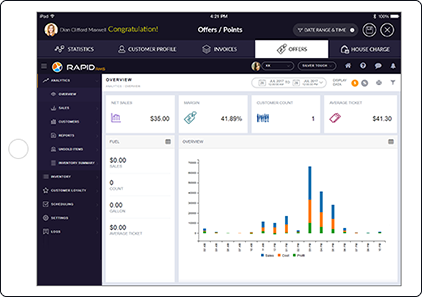 It’s easy to train employees on Rapid Onsite. With the familiar technology of an iPad, your staff will be trained to check-out quickly and hassle-free. Manage multiple locations anywhere, anytime with Rapid Onsite. 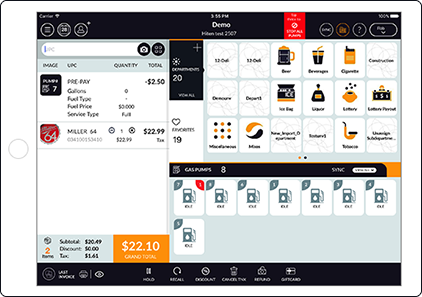 Remotely update pricing, track inventory, monitor employees, and set promotions for any store you manage. by fuel type and fuel prices per gallon.